One of the most enduring Easter traditions is egg painting. Kids love it, grown ups love it, it’s a great family activity. It used to be that all eggs were created equal – it was always the same designs, year after year. But now that we live in the age of google images and Pinterest, the ideas are endless. My take on Modern Easter Eggs includes colour blocking, stamps and lots of navy and gold. Some really different shapes and hues to update the most traditional of Easter decorations. P.S. I highly suggest buying wooden or foam eggs for this. They won’t go bad and blowing out real eggs is exhausting! Spray paint the eggs in blue and white. Let dry completely between coats. We have a lot of snow right now so I used it as a stand to hold up my eggs while I painted them, but a block of Styrofoam works too. For the stamped eggs, after the paint is dry, use an ink pad to stamp multiple pictures all over the eggs. When stamping, gently roll the stamp onto the egg, this will help leave a full image and stop the stamp from slipping. Paint colour blocks in white or blue onto the eggs and let dry. Add gold to the eggs in various shapes and stripes. Choose a vase to display your eggs in, I picked a terrarium, and let your modern Easter decorating begin! 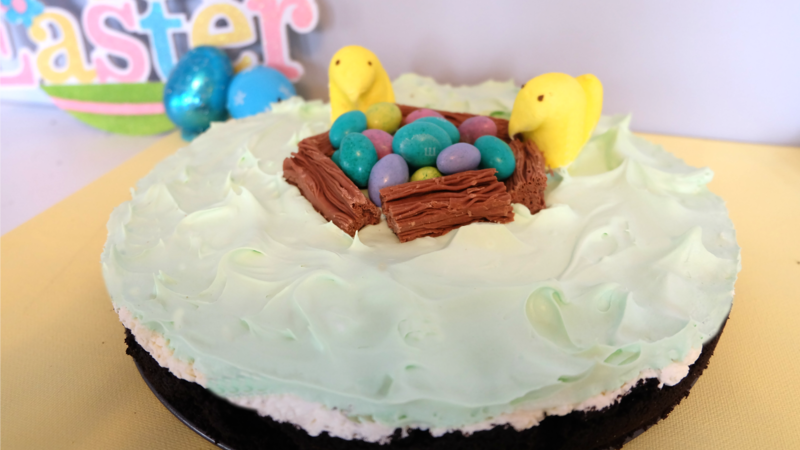 Easter Decorating Ideas - With Candy!